Come join us on Saturday, August 25 at 4102 Figueroa Street at Avenue 41 for food music fun and games. Enter for a chance to win a free pottery class! Winner will be selected at the Grand Opening on August 25 at our studio. Two Great Ways to Win a Free Class! 1. Stop by the Grand Opening, enjoy the fun and sign up for our mailing list. It's that simple. 2. 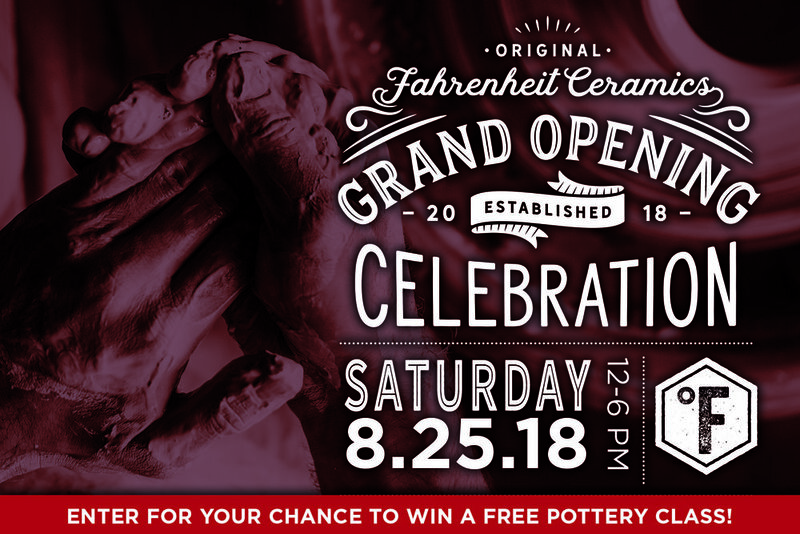 Follow us on Instagram (@fahrenheitceramics) or Facebook (Fahrenheit Ceramics Highland Park) and comment on the Grand Opening post with the name of someone you think would like to take a class with us! You can only win one class, if you win both the online and in-person contest a second winner will be chosen. Online winner will be announced online. In-person winner will be emailed with details for registration after August 26th and will be announced online with the permission of the winner.